Family Tech: Can You Drop Your Laptop? Netbooks may be puny, but they're getting bigger and more feature-packed  and they're more popular than ever. Last year, global netbook sales exceeded those of the iPhone; despite the recession, demand remains strong. Brian Chen, PC analyst for market research firm Display Search, predicts second quarter sales will exceed 9 million units, a 50% increase over the first quarter. 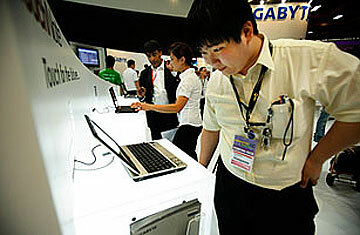 (Global computer sales fell 7% in the first quarter compared with the same period in 2008.) "We've already increased our forecast [for netbook sales] to 30 million this year and they'll probably count for 24% of all notebook PCs sold," says Chen, who called the growth of the category "amazing." Asustek Computer, the company that practically invented the netbook category when it launched the Eee PC 701 in 2007 for $400, also has a model with an 11.6-in display. The Eee PC Seashell 1101A will sell for around $599 when it debuts this month. And, taking a cue from popular touch-screen mobile phones, the Taiwanese company introduced the Eee PC Touch T91, which has a rotating display that responds to touch commands. It goes on sale in July for around $599. And through greater use of power-saving components, longevity is continuing to increase. The Asus Eee PC Seashell and MSI's U115 Hybrid netbooks both offer up to 11 hours of battery life. Chipmaker NVIDIA showcased netbooks powered by its Tegra processor that are capable of 10 hours of 1080p video playback on a single charge. Pallenberg says the new platform is promising, "It will change the world of mobile computing because people want more performance without more power consumption." Tegra devices are expected to appear this year for around $200. Netbooks are inspiring a flurry of technological cross-pollination between mobile phones and computers. At Computex, wireless telecommunications company Qualcomm rolled out a new subcategory of portable devices it calls "smartbooks"  small computers based on Qualcomm's Snapdragon processor that, because they don't require heat sinks or cooling fans, will be even thinner and lighter than many netbooks, yet can run for 10 hours without recharging and will be capable of fast wireless Internet connections via Wi-Fi and mobile phone networks. Perhaps best of all, Snapdragon-based smartbooks  think of them as a smartphone on steriods  are expected to sell for around $200 when they start hitting the market later this year. "Netbooks are going to have a totally different look and feel a year or two from now," says Kan. "But they won't replace the smartphone. Eventually, in your bag you're going to have your mobile phone and your netbook." That's what manufacturers are hoping for, at least.